The Chinese Wikibook has two identical versions; Simplified and Traditional. This is done to unclutter the textbook and to meet the needs of people either interested in the characters used in China or used in Taiwan. However, whenever a change is made in one version, it is not automatically carried over, so periodic checks must be made to ensure that the two remain in sync. This sometimes involves translating from one script to the other, but often only involves copying formatting changes. 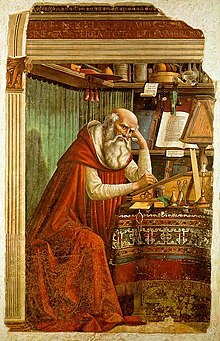 Saint Jerome, the patron saint of translators. Even if a translation has been done at one time, it may have been incomplete or not been updated to reflect recent changes on the English site. Please work to keep them current. If you can only do a partial translation, leave a note to later contributors linking back to your source (a good candidate for using Templates). The ones listed above the divider are translations of this book. The ones below are of their own design. In addition to the main page, Lesson pages, Stroke Order pages and anything else can be interwikied as long as the content is the same. There is a project on Wikicommons to upload images and animations of the stroke order for characters. There are directions on how to contribute. It's easy with the use of some free programs and can be done even with only a basic understanding of Chinese. Please contribute so that we'll have a standardized reference for our Wikibook users. With a microphone and a read through the recording guidelines for the Spoken Wikipedia you can contribute audio examples. Sound samples are particularly important for beginners, especially ones who are studying alone with no teacher or native speaker on hand. You can see what has been uploaded so far at Category:Chinese pronunciation. Peter Isotalo started, but a native speaker would be best. This page was last edited on 14 December 2016, at 18:24.